"For years, Harry Dresden has been Chicago's only professional wizard, but a bargain made in desperation with the Queen of Air and Darkness has forced him into a new job: professional killer. Magic. It can get a guy killed"
I have been an avid fan of the Dresden Files for close to 10 years. A college housemate was a huge fan of video games, heavy metal, swords, Dewar's, and Harry Dresden. Unsurprisingly we got along reasonably well and I enthusiastically read through his collection of Dresden books, then waited anxiously alongside him for the next book to come out. Cold Days made me laugh, tear up, and I had a hard time putting the book down. After the first read I really had a hard time summarizing my reaction or writing any sort of review. It was just sort of "wow." I just finished a second run through Cold Days, this time as audio book (read by James Marsters who is perfect for the series). While attempting to avoid spoilers, I have to admit I was... dubious about Cold Days before I started it. Largely due to the previous novel Ghost Stories which stars a spectral Dresden, there were many ways that the series could have become unbearable. The fact that there was a book with him as a ghost had previously made me leery, but it was well handled and now was just my qualms about the inherent cheese risk of Dresden still being around. Happily my fears are pretty much solidly stamped out and I cannot wait for the rest of the series to come out. I do not recommend starting the series with Cold Days. The first 7 or 8 books in the series can pretty much be read without familiarity of their predecessors, as Butcher does include little reminder summaries so that the reader can place the significance of who or what Dresden encounters. As the series has progressed, especially around book 10, back story becomes very important as the previous incidents start being woven into the now-current events. Cold Days is built solidly on the world and its events that Butcher has created through his earlier novels. 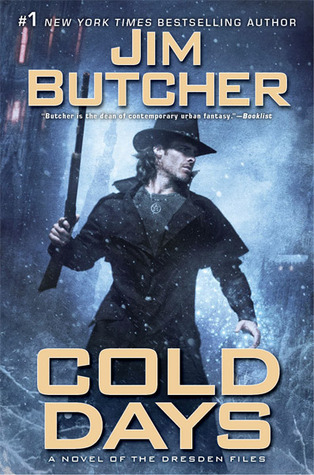 So, I guess by raving about Cold Days, what I'm really saying is "if you haven't read any Dresden Files, go read the whole series." The Dresden Files remains one of my all time favorite series. Some of the books I like less than others, but whenever I re-read any of the books I discover I still adore it regardless of how it stacks against the other Dresden novels.